Today it was back to Nairobi. 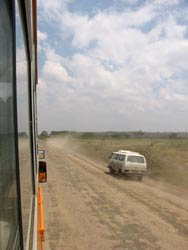 Another mammoth drive - at this point I'm not sure I thought this through very well, since the itinerary of my next trip starts with us heading straight back to the Masai Mara and I'm not sure I have enough motion sickness pills for these roads! The drive wasn't very exciting since it was straight back on the road we'd taken only 2 days before. But we did have a fairly interesting end to the trip - Moses our cook got literally nabbed out of his passenger seat by a cop for not wearing his seatbelt and put straight into the back of the Police van. Apparently they're fairly strict about this in Kenya. But he was okay and just had to pay a fine.